Obaaberima, Tawiah Ben M’Carthy’s Dora award winning tale of duality is back at Buddies in Bad Times for a limited time. When Obaaberima debuted at Buddies in Bad Times theatre six years ago, it generated the appropriate amount of chatter a production of this emotional magnitude deserves. Sweeping the 2013 Dora Awards, writer/performer Tawiah Ben M’Carthy, took the story of Agyeman across Canada, stunning audiences with its verisimilitude, painful honesty and haunting score. Back by popular demand, Obaaberima is set to kick off its 2018-2019 production, in a more stripped back and intimate setting – retaining all of the glory that made it such a complex portrait of queer existence back in 2013. Tawiah Ben M’Carthy in Obaaberima. 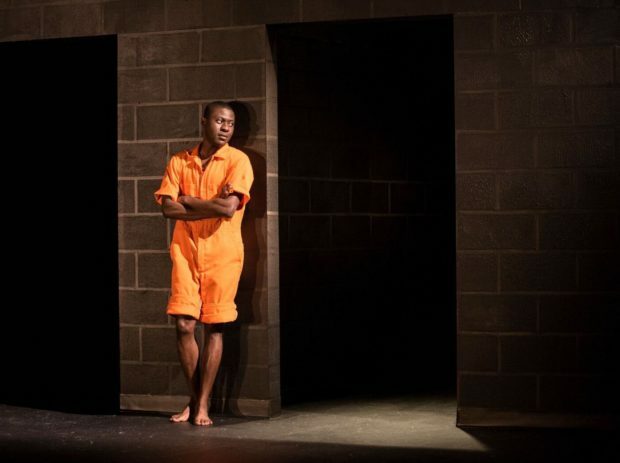 M’Carthy begins the play in a Canadian Prison. After a violent assault is committed in response to a homophobic slur and all around disgusting attitude, Agyeman is near the end of a three year sentence. From here, M’Carthy and the character of Agyeman takes us back to the beginning, as a young child living in Ghana. The audience witnesses it all, starting with the relentless teasing, the term Obaaberima—a derogatory phrase in the Twi language meaning “girly boy”—a near constant throughout Agyeman’s childhood. Then to the first sexual experience with Opayin, a local tailor and painter, who helps him discover the duality of his soul in the form of a painting – referred to as the free flowing character of Sibongile throughout the play. We see M’Carthy find youthful love in Nana Osei, losing it in an instance of miscommunication and heartbreak. Ultimately we watch as Agyeman struggles with living as a gay man in a world that doesn’t understand nor accept the two sides of his soul. A minimalist set at Buddies in Bad Times Theatre for one-man show Obaaberima. There are a few narrative moments like these that serve as signposts if you will, along M’Carthy’s journey. Moments that aren’t lauded as important, but from the audience perspective, clearly represent major milestones. 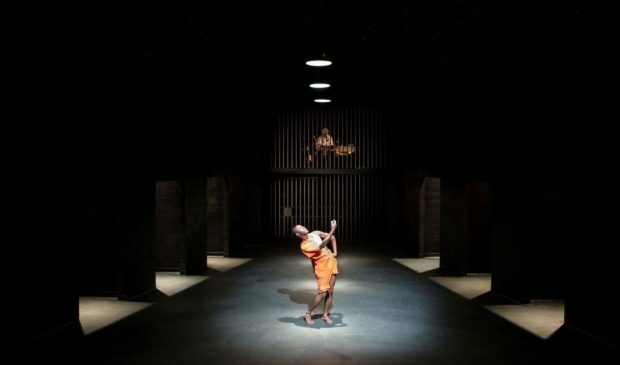 The minimal but effective use of lighting from director Evalyn Parry and lighting designer Michelle Ramsay, help these milestones feel organic and revelational. The lighting, pared with the phenomenal score from Kobèna Aquaa-Harrison, gives Obaaberima a visceral texture that permeates throughout. The ingenious staging decision as well – placing Aquaa-Harrison above the jail cell that serves as the backdrop, was fantastic. It gives the music a weightiness that would have been missing if the music had been piped in. One-person shows are incredibly difficult to do well. Transitioning from character to character can be awkward if not staged correctly, something Parry and M’Carthy took into consideration. All of M’Carthy’s movements feel balletic, down to the character transitions, which gives a flow to the action that never felt stiff or out of place. Overall Obaaberima is a must-see production. Running until December 9th, Tawiah Ben M’Carthy’s journey of love, loss and authenticity is a love letter to the children who every day struggle to understand who they are in a world that is often callus and unfair. It’s a physical performance connected to universal truths, making it a production at once relatable in its interactions with bigotry and ignorance, and tearful in it’s honesty. I loved everything about Obaaberima and I guarantee you will as well.